The recent “nonreligious turn” in studies of secularity has changed the focus from what secularity lacks in comparison to religion to what it offers as an alternative. Various forms of nonreligion have been studied extensively in recent years, yet mostly in the contemporary Western societies. This article shifts the context more to the east and also towards the history by comparing two instances when meaning-making gained a central position within an atheist tradition. For our first example, we examine the appeal to spirituality in the period of late Soviet atheism; the second comes from contemporary Western “atheist spirituality”. By studying the publications by relevant authors, the article explores what can be learned about atheism and spirituality from this comparison, how atheism and spirituality are understood and combined, and the reasons for the sudden emphasis on existential questions within an atheist tradition. Today, bookstores offer a multitude of books about spirituality and other self-help guides that are intended to help in finding meaning and fulfilment in life. Most of these leave an impression of belonging to some sort of (quasi-)religion, but some of them – such as Atheist Spirituality, Rediscovering Spirituality in a Material World, or A Guide to Spirituality Without Religion – seem to be just a materialized cognitive dissonance. Taira’s (2012) statement, “It is difficult not to draw the conclusion that the function of putting two catch-words in the title – atheism and spirituality – is to make it a more tempting choice in the bookshop,” seems like an adequate reaction. Yet, along with the increasing visibility of the so-called “new” atheism and rise of the “nones” (Voas 2015; Woodhead 2016), there has also been a rise in visibility of secular “existential cultures” (Lee 2015) that combine seemingly contradictory elements. For instance, since 2013, under the heading of Sunday Assembly (Bullock 2017), a group of atheists have gathered on Sundays to hear spiritually uplifting speeches and sing together, something that seems much like a church-related practice. Is it also a form of cognitive dissonance or does it point to a different understanding of spirituality – or of atheism? The tension lies in the fact that in Western thought atheism is often accompanied by materialism, (ontological) naturalism, rationalism and other lines of thought that typically oppose religion and/or deny the possibility of otherworldly existence. Spirituality, on the other hand, is typically associated with religion, something otherworldly or transcendent, therefore “the entire line of ‘spiritual’ thinking” in association with secularity is often perceived “as nothing more than a metaphor run amok” (Eller 2010). Perhaps this is the reason why atheism in combination with spirituality has been largely neglected in academic research (exceptions include Baggett 2011; Caldwell-Harris et al. 2011; Schnell & Keenan 2011; 2013; Taira 2012). Yet both atheism and spirituality serve as umbrella terms for a wide variety of attitudes, values, goals, beliefs, and ways of acting. For instance, in contemporary research literature, over 50 different definitions of spirituality have been identified (Skrzypińska 2014: 280), divided between two main understandings: “a watered down religion that has benefit only to the practitioner” or “providing a way to connect with the transcendent without the confinement of organized religion” (Ecklund & Long 2011). The understanding of atheism is perhaps even more complicated. Many of its definitions bear “no straightforward relationship to its strict etymology” (Bullivant 2013), since atheism is culturally constructed (Baggett 2011), and always rejecting a particular, culturally rooted concept of the divine (Armstrong 2009: xv–xiv). Therefore, there is no uniform atheism; rather we can talk about different atheisms that vary in time and place. So far the study of atheism from a historical point of view has mostly focussed on how religion has been opposed. Yet, is it possible that somewhere in the hotchpotch of ideas and traditions, “atheism” and “spirituality” are not at odds; where their combination is not only a metaphor and the two can have some sort of meaningful positive relationship? A particular case from recent history attracted our attention: “spirituality” and “atheism” appear together in the case of late Soviet atheism (cf. Smolkin-Rothrock 2014). This flooded us with many questions, and since it has been recently asked, “Are there are some elements of scientific atheism that scholars in Western Europe and North America might actually learn from?” (Alles 2018), we took on the endeavor of comparing contemporary atheist spirituality to the “spiritual turn” in the late Soviet atheism and chose “What can be learned from that comparison?” for our main research question. In particular, we are interested in how “spirituality” and ”atheism” are understood, what is their mutual relationship, what caused the sudden emergence of this combination and, finally, what does it tell us about the patterns of development of atheist traditions? Our comparison is based on the analysis of relevant books. The “spiritual turn” in Soviet atheism is addressed according to literature printed in Soviet Estonia, which offers a possibility of narrowing down the material and assessing the atheist propaganda in a particular cultural context. Five books were analyzed: Lutheranism Earlier and Now (1969) and Indifference – Is It Good or Bad (1981) by Kuulo Vimmsaare, and Believers and Communists (1972) by Lembit Raid, both prominent figures of atheism in the Soviet Estonia; and two collections of articles, both translated from Russian: Atheism, Religion, Morality (1976) and Individual Approach in Atheist Explanatory Work (1976). All books belong to a certain version of “scientific atheism”, an almost unreadable genre of popular-scientific propaganda, meant for both common readers and propagandists. Although there are minor differences, the books represent more or less similar understanding of both atheism and spirituality, and were selected because they were almost the only representatives of the Soviet spiritual atheism in Estonian context. This material is supported by findings from Soviet era archives in Estonia. From the contemporary atheist spirituality, we examine three books written by atheists with a focus on spirituality: The Book of Atheist Spirituality: An Elegant Argument for Spirituality without God1 (2006) by French philosopher André Comte-Sponville; Going Godless: Rediscovering Spirituality in a Material World (2010) by American computer programmer J. K. Fausnight; and Waking Up: A Guide to Spirituality Without Religion (2014) by American neuroscientist and new atheist Sam Harris. The selection criteria were that the authors consider themselves as atheists, the word “spirituality” is included in the books’ titles, and the focus of the books is on aspects of spirituality. Since we are interested in how different concepts are described and tied together, our attention is on argumentation. We do not assess the lived experiences of spiritual atheism or the success of either tradition since life is too multi-layered and the impact of the texts can be much more complicated than one might expect from ideological texts of the past empire or from the contemporary self-help genre. So, without any further ado, we now jump to our case studies and discuss our findings later. Atheism in the Soviet context did not have a uniform meaning; the use of the word depended on the context. In Communist Party materials, atheism implied a militant attitude toward religion, as well as the propaganda of atheism, often in a form of secular rituals. In other contexts, the term was used for state policy that originated from atheist ideology. Thus, atheism also implied an action deriving from a philosophical position. In common usage atheism was understood as a mere lack of religion (Remmel 2016). “Scientific atheism” referred to a semi-scientific discipline for studying religion and atheism, with the goal of assisting the disappearance of religion (Kääriäinen 1989: 11), also described as a conviction about the nonexistence of God that is based on three pillars: science, materialist philosophy, and personal experience (Vimmsaare 1981: 90–91). Although the banner of atheism flew above the Soviet Union from its beginning until its end, the attitude towards religion and the effort the state expended in atheist propaganda was dependent on time, place, and individuals who were in charge at the local level. Therefore, despite the centralized system, the situation across the Soviet Union varied to some extent. In this article we focus on atheism in the Estonian Soviet Socialist Republic. As a non-Russian speaking and historically Lutheran part of the empire, atheist propaganda in Estonia was somewhat isolated and entirely dependent on the activity of local activists of atheism, and translations from Russian. Yet, the situation was still influenced by the same currents that influenced the Soviet Union in general; however, what is said here about Soviet atheism is just one reflection of the overall trends, and its reverse engineering into the general Soviet religious situation should be done with care. Estonia was occupied by the Soviet Union during 1940–41 and then again in 1944–91, thus eluding the experience of Soviet militant atheism of the 1920s and 1930s (see Husband 2000; Peris 1998). After the Second World War, until the end of Stalin’s reign in 1953, atheist propaganda was secondary, so Estonia only became acquainted with “scientific atheism” (discussed below) when Khrushchev’s anti-religious campaign started in the late 1950s (Anderson 1994). In order to create a “New Soviet man”, the remnants of “bourgeois ideology” – including religion – needed to be overcome. During the atheist campaign, many methods were implemented: from more hidden ones, such as administrative and economic measures, to more visible ones, such as intensified propaganda through printed media, atheist lectures and Soviet secular rituals (Remmel 2015). The campaign ended in 1964 – religion no longer posed an institutional threat (Luehrmann 2015: 163) – but it was evident that creating an atheist society in one fell swoop was impossible and other tactics were needed. At the same time, Soviet atheism had its own problems. Despite being called “scientific”, atheist propaganda was characterized by low level argumentation, a militant attitude and monotonous messages (cf. Smolkin-Rothrock 2014), consisting mostly of mocking clerics, ridiculing religion through contrasting it to science, and so on, resulting in atheist propaganda acquiring a bad reputation. For instance, a lecture held in the Stalin Kolkhoz in Orissaare, Estonia, was delivered so poorly that “of the 116 people who attended the lecture, only two stayed until the end—the local chairman and his deputy” (Mets 1956). This example should not be overgeneralized, but “the need to raise the scientific-ideological level of atheism” remained a constant topic in the discussions among leading propagandists of atheism (Remmel 2011: 227–228). An even bigger problem was the apparent success of the anti-religious campaign. Religion was banished to the periphery, but without a visible enemy, atheist propaganda was considered an “empty and pointless struggle” (EFA 1), not only among common people but also among party officials (Smolkin 2018: 200), and even ridiculed (Valton 1968). By the end of the 1960s, Estonian propagandists of atheism admitted “a stagnation in atheist thinking”, proposing ironically that “perhaps atheists have nothing more to laugh at” (ERA 1). Concurrently, it became evident to Soviet scholars that not all nonbelievers were atheists as was previously thought. Many cared neither about religion nor atheism, and the extent of this attitude was shocking. Surveys conducted in different parts of the Soviet Union in 1968 indicated that more than half of the respondents were “indifferent” towards both religion and atheism (Vimmsaare 1981: 27). To remain relevant in the changing Soviet society, atheism had to readjust, a process Smolkin-Rothrock (2014) has called “the spiritual crisis of late Soviet atheism”. The target group of atheist propaganda changed significantly, since it became necessary to justify atheism both to believers and nonbelievers, and the struggle against religion, at least partly, changed into (disguised) apologetics. The change was presented as deriving from the necessity to respond to developments within religion resulting from the “deep moral crisis in capitalist countries” (Vimmsaare 1969: 145), explicitly assuring that “the changes do not reflect current tactical needs” (Raid 1972: 105). This was clearly untrue. The problems of the late Soviet atheism sprang mostly from the understanding that atheism was perceived as something “against,” not something “for”. The lack of a clearly defined positive message may be attributed to Marxist atheism as formulated by its founding fathers: “Atheism is a rejection of God and affirms the humanity of Man just by the same rejection” (Marx & Engels 1974: 127). Thus, atheism was understood as having a dual nature: one of destroying and one of building up. By the late sixties it became clear that the connection between the rejection of God and the affirmation of humanity was not so self-evident. While rejection had been communicated quite forcefully, the other half remained obscure and when the retreat of religion from the public sphere rendered a militant attitude irrelevant, something had to change. Central to this worldview was the concept of “consciousness” or “awareness”, an inherent element of the Soviet way of life, which allegedly distinguished Soviet society from earlier societal orders through being constantly aware of one’s life goal: “For the first time in history, the whole society works together in the name of a common big goal. Soviet society consciously builds up Communist society” (Vimmsaare 1969: 160). Due to this, Marxist atheism considered itself the highest form of atheism, differing from the pre-Marxist forms of atheism that had appeared in history as well as atheism in capitalist countries (“bourgeois atheism”). The “new” approach, therefore, was not a new form of atheism, just a change of focus – the earlier Soviet atheist ideal, the “militant attitude”, was reforged into “awareness”. Awareness gave atheism an “active character, the most distinctive feature of Marxist atheism” (Dontsov 1976: 106). But what exactly was the “active character of atheism”? Raid’s (1972: 61) account of the function of atheism describes both the previously mentioned idea of the dual nature of atheism as well as its active character: “For Marxists, atheism is not only the rejection of god(s). … Scientific atheism includes the system of positive knowledge that drives off religious views, at the same time functioning as a worldview.” Thus, atheism was not a mere lack of beliefs (a position sometimes called negative or weak atheism), but a constantly present rejection of God (strong or positive atheism) based on a scientific worldview, which influenced a person’s actions, goals, identity, practices, beliefs, and so on. Therefore, the late Soviet atheism tried to establish itself by fighting for “conscious atheism” within the Soviet way of life. The change was also reflected in the usage of technical terms: in the 1970s, “antireligious propaganda” was replaced by “atheist propaganda” or “atheist explanatory work”. The importance of atheism sprang from its inherent relationship to the scientific worldview of Marxism-Leninism which, according to ideologists, tied together all aspects of Soviet life. Through atheism, people received “scientific knowledge about nature, society, man, and morals” (Raid 1972: 63). Science had to replace religion in the spheres that had previously been under the control of religion (e.g., using medicine rather than prayer in order to receive healing), for which atheism was the first step; atheism was also the result of the scientific worldview. In this way, atheism was simultaneously a cause and an outcome which, through being “conscious”, inevitably led to spiritual development. The term “spirituality” in Estonian (and Russian) often has a religious meaning,3 but it also encompasses morality, courage, wisdom, social responsibility, cultural and intellectual interests, creativity, and so on – all of which can be understood without religious connotations, as was the case during the Soviet period. For instance, a person has “spiritual interests” when he reads a lot, goes to the theatre, studies at the university or reflects over existential questions – as opposed to being concerned only over “materialistic” things like money or having a car (which in the Soviet Union gave a person a somewhat semi-godly status). This aspect of spirituality became increasingly important after the 22nd Congress of the Communist Party of the Soviet Union in 1961, when the Moral Code of the Builder of Communism was adopted.4 Morality was seen as “universal to mankind in general, its content not essentially religious, but the church seized it a long time ago and started to interpret it religiously” (Vimmsaare 1981: 69) – the importance of morality derived from its direct connection to collectivistic values, which were reflected in work ethics and the meaning of life (see also Peris 1998: 93–98). Springing from a Marxist understanding of religion as opium of the people that “implants passivity, feebleness and humiliation” (Vimmsaare 1969: 158), a common stereotype presented believers as not participating “actively” in life (for instance, going to the theater, or playing sports), preferring to stay at home, praying, and staring the icons on the wall instead (Sheinin 1964). This was in direct opposition to what Soviet society needed: “brave, energetic and cheerful people, who are not only dreaming of a better future, but who are also prepared to fight for it” (Vimmsaare 1969: 158). Therefore, believers were considered individualistic, working only in order to save their soul (Molchanova 1976: 15) as opposed to “making one’s contribution to the progress of society” (Vimmsaare 1969: 159; see also Figure 1), the ultimate goal of a “normal” Soviet citizen. It was even claimed that by trying to save one’s soul “the believer declares indifference toward the fate of other people” (Duluman & Romenets, 1976: 25); others argued that “A person cannot be moral and harmonious when one’s activity is not associated with the needs of societal progress” (Dontsov 1976: 105). “Atheists’ high morality” however, was considered a “socially conditioned fact”, and these social conditions had “an irrefutable effect on everyone who is in touch with the reality of Socialist society” (Kitchanova 1976: 59). Spiritual development in this context means that “in the moral consciousness of a Soviet citizen religious ideals are replaced by the ideals of building up the Soviet Society” (Kononenko 1976: 40) and atheist propaganda had much to do here, in helping believers to become interested in “actual life” (Vimmsaare 1969: 159). Therefore, the goals of atheism were threefold: differentiating religious spirituality and morality from atheist spirituality and morality; detaching religion from spirituality and morality; and finally, associating spirituality and morality with atheism. 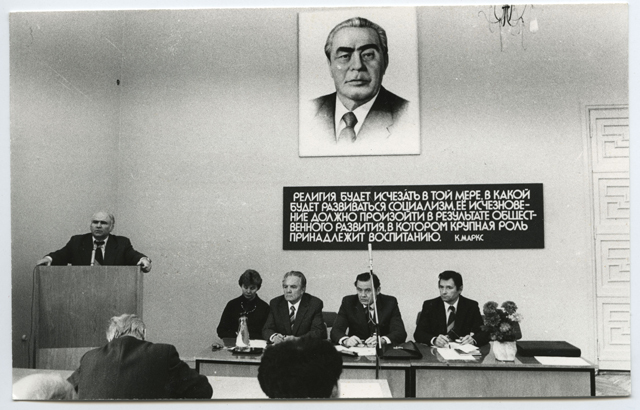 All-Union scientific-practical conference in 1982, dedicated to the actual questions of the ideological work of the Communist Party of the Soviet Union. The banner reads (translation from Russian): “Religion will disappear in accordance with the development of socialism; its disappearance must happen as a result of the development of the society, in which upbringing plays a major role. K. Marx.” Source: ERA 5. In the end it all formed a more or less circular system: the rejection of god is a beginning that leads to a scientific worldview that leads to personal spiritual development that leads to better understanding of the Soviet society and high morality, all of which lead to collective work in the name of the communist future that, through societal conditions (the social roots of religion are cut), produces atheism. In this respect, atheism was a prerequisite for building a Soviet society. However, rather than answering the actual “life’s questions”, Soviet atheist authors chose to focus on ideological justification by trying to offer a “wholesome and meaningful worldview” (Smolkin-Rothrock 2014), presented through a maze of hollow slogans which, despite a somewhat milder tone when compared to propaganda of Khrushchev’s anti-religious campaign ten years earlier, mostly consisted of direct oppositions to religion. Despite having the underlying positive program of science providing answers for secular life, values, and practices – an alternative cosmology, as Smolkin (2018: 8) calls it – “scientific atheism” was unable to deliver its message in a positive form: “we provide either statistics or philosophy, and other than that we give nothing” (Smolkin-Rothrock 2014). Alles (2018) asks: “What specific views and theories did scholars espouse and defend in the name of scientific atheism, besides just the obvious?” but the vast majority of the literature does indeed represent “just the obvious”. Considering the fact that most of the atheism lectures (the main form of Soviet atheist propaganda) took the form of verbatim recitations of texts sent by Knowledge Society (which promoted Soviet ideology through public lectures) central organs, it was not surprising that it all led to the “decrease of the reputation of atheism” (ERA 3) as Soviet atheism propagandists complained that “people seem to be afraid of atheist lectures” (ERA 4) while indifference toward atheism and religion took hold (Remmel 2017). In Western culture, atheism has become a major subject of public discussion in the 21st century – partly because of the high visibility of new atheism, and partly because the numbers of the non-religious and atheists has grown rather fast, even in the United States (Zuckerman 2012: 3). Also, different combinations of atheism and spirituality have gained popularity to an increasing extent for a variety of reasons. First, in broad terms, after World War II, the growth of atheism and secular spirituality was probably enabled by several interrelated sociocultural factors, including increased wealth and security, greater freedom of religion, globalization and the presence of ‘foreign’ religions (such as Buddhism and Hinduism), secularization, the growing support for science and education, and the rise of individualistic values (as opposed to tradition and conformity) along with a cultural awareness of naturalism, atheism, and the critique of religion (see Norris & Inglehart 2004; Zuckerman 2007; Taylor 2007; Helkama 2009; Frisk 2010, Casanova 2011; Norenzayan & Gervais 2013; Sillfors 2017). As a result, seeking answers to spiritual needs have moved, as Frisk (2010) has crystallized, from a particular to an eclectic religion, from dogma to experience, from collective to personal, from hierarchical to egalitarian, from theological to anthropological, and from after-death to this-worldliness. These approaches are typical also in present day secular (and atheist) spirituality and reflected as well in the increasingly popular self-identification, “spiritual, but not religious” (Huss 2014). Second, from the outset of the movement dubbed “new atheism” (here dated from Sam Harris’s book, The End of Faith, 2004) the debate over atheism and religion has become highly polarized. However, some atheists have argued that the new atheism has gone too far with its harsh criticism and want to show that atheism can be “softer” and focus on the “good things” of religions like communality, arts, practical (meditative) methods, and ritual structures. These “bridge-builders”, for example Alain de Botton’s Religion for Atheists (2012), J. K. Fausnight’s Going Godless (2010), and Greg M. Epstein’s Good Without God (2009), apply an eclectic “pick and mix” style which is nowadays typical: let’s take the best bits from different religions and philosophies, while rejecting the gods and other supernatural elements. Third, for centuries spirituality has been more or less synonymous with religion and therefore it has been the general view that atheists cannot feel awe, or be moral or spiritual. This attitude is still strong, for example in the United States (see Caldwell-Harris et al. 2011; Cherry 2013; Gervais 2013; Gervais & Norenzayan 2013; Cook et al. 2014; Franks & Scherr 2014) In response, some atheists – for example, André Comte-Sponville in The Book of Atheist Spirituality (2006) or Eric Maisel in The Atheist’s Way (2009) – have tried to argue that atheists can feel awe, and be as moral and ‘spiritual’ as any religious person. Even the new atheists, Sam Harris (2014) and Richard Dawkins (Discover Magazine 2010), have publicly expressed their support for spirituality – as long as it does not involve belief in the supernatural. All three Western authors – Fausnight, Comte-Sponville, (see Figure 2) and Harris – are avowed atheists. Fausnight defines atheism as “lacking belief in a god”, but he admits that he himself is one of the ‘hard’ atheists, who believes that “there is no God, rather than one lacking belief in God” (Fausnight 2010: 9, italics original). Similarly, Comte-Sponville defines atheism as a negative belief, “without God”, but he considers himself as a “nondogmatic atheist” (Comte-Sponville 2006: 75). Harris does not define atheism explicitly, but he too openly reveals, “I am an atheist” whose “mind is open” (Harris 2014: 176). 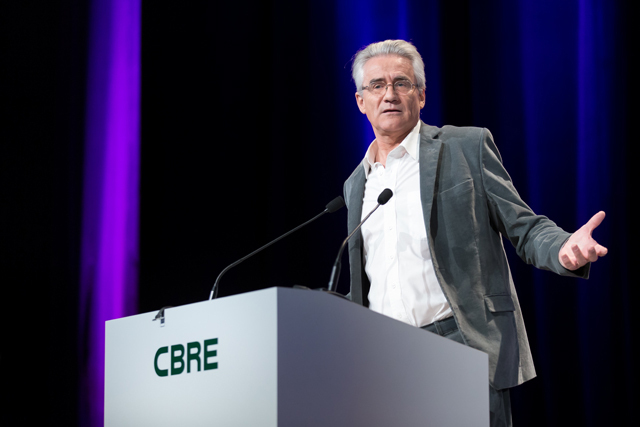 André Comte-Sponville lecturing at Paris (January 2013). Source: Wikimedia. Although promoting naturalism and science, all three agree that life or reality contains some magical or mysterious elements beyond human knowledge. Fausnight (2010: 231–232) says that human experience will never be fully explained by science and that “There is something that I can only describe as magical […] that happens on a warm summer evening on the back porch while sipping a good wine and listening to B. B. King playing the blues guitar.” Harris (2014: 56) sees the emergence of consciousness from material as a “mysterious” phenomenon. To Comte-Sponville (2006: 142, italics original) the whole “Being is mysterious – everything is mysterious!” Such descriptions reveal an experience of awe, an overwhelming feeling of reverence and wonder at simply being alive in the universe. Overall, these three authors view spirituality as something very experiential and personal. To Harris (2014: 7–11) the word spirituality encompasses mainly transcendent experiences and finding deeper well-being. The human mind is the key concept in Harris’s book, because “Our mind is all we have. … Every experience you have ever had has been shaped by your mind” (Harris 2014: 2). Harris highlights the role of introspection of consciousness and understanding of mind in the case of the definition of spirituality: “rigorous introspection – ‘spirituality’ in the widest sense of the term – is an indispensable part of understanding the nature of mind” (Harris 2014: 62). Similarly Fausnight defines spirituality as a construct of the human mind: “When I speak of spirituality, … I am speaking of that … virtual reality we construct in our minds. … It is our mind that means everything to us” (Fausnight 2010: 15–16). Fausnight (2010: 235–246) crystallizes his ten principles most important to spirituality, such as finding meaning, inner peace, mindfulness, self-respect, oneness, health, beauty, wonder, and awe. Moreover, Comte-Sponville says (2006: 136) that in the broadest sense of the word, “spirituality can be said to include virtually all aspects of human life and spiritual is more or less the synonymous with ‘mental’ or ‘psychic’.” He is speaking about spirituality as a “part of our inner life … the part that involves the absolute, the infinite and the eternal” (Comte-Sponville 2006: 136). Just like for Harris and Fausnight, for Comte-Sponville the key dimension of spirituality is individual experience: “Metaphysics means thinking about these things; spirituality means experiencing them, exercising them, living them” (Comte-Sponville 2006: 136). So, Fausnight, Harris, and Comte-Sponville all represent a highly individualistic approach to spirituality, emphasizing personal freedom and achievement. They seek meaning of life and happiness from within, rather than from outside. This connects strongly to aspirations of self-transcendence – the pursuit of losing self-centered egoism – and emphasis on positive feelings, such as love, compassion, and joy. Fausnight regards meaning as the most important aspect of (atheist) spirituality, and the first of his top ten spiritual principles is: “Give yourself purpose and create meaning … It is inside you” (Fausnight 2010: 235, italics original). Several of his other spiritual principles also deal with meaning, like, “Find beauty everywhere” and “Live in wonder and awe” (Fausnight 2010: 245–247). Meaning equates to happiness and the goal of spirituality is inner peace and mental balance. These can be attained by a selfless attitude and meditation practice: “There is a ‘transcendental’ state that can be achieved through meditation” (Fausnight 2010: 183, 216–217.) Fausnight also highlights the principle of agape, a universal, unconditional love: “Agape is so important because it is one of the ways we bring meaning into life” (Fausnight 2010: 157, italics original). Similarly, for Harris, the human mind is the only tool for seeking meaning (Harris 2014: 2). The key is meditation, which helps to break the illusion of permanent ‘self’ that causes a lot of human suffering. Meditation allows people to step into the present moment and experience the pure consciousness itself which, “prior to self-representation, is intrinsically ‘blissful’” (Harris 2014: 227). By self-transcendence Harris means this direct experience of consciousness, which does not suffer like the illusional, conventional, and egocentric ‘self’ does: “[S]elf-transcendence is possible. … every present moment of consciousness is profound. … Experiencing this directly … is the true beginning of spiritual life” (Harris 2014: 206). Harris too emphasizes the pursuit of unconditional love, detailing his own experiences of transcendence, which first occurred in his youth when he took MDMA (a type of drug, also known as “ecstasy”): “I was no longer anxious … I was feeling boundless love … It was simply obvious that love, compassion, and joy in the joy of others extended without limit”. He relays that he has had several similar experiences, achieved through regular meditation exercises, which he also instructs about in his book (Harris 2014: 4–5; 82). All these writers also represent autonomous morality – morality is seen to be based mostly on natural empathy and altruism. Harris sees a connection between meditation, self-transcendence, and living ethically, and asserts that some mental states, such as “boundless love”, are “intrinsically ethical” (Harris 2014: 14). For Fausnight the highest form of morality is purely altruistic, it comes “from within”, and is free from religion: “The morally altruistic base their morals on compassion for others. … [A] truly altruistic person does not act to please God or society […] To become whole and good, we need to break free at each level of self-centeredness and view ourselves as members of the community of mankind” (Fausnight 2010: 195–199). Similarly, Comte-Sponville (2006: 41–42, 206) writes about the autonomy of morality, and asserts that morals are the basis of religion, not vice versa. This individual meaning-making partly explains why Eastern religions play a fairly important role in these books. Harris says: “Buddhism in particular possesses a literature on the nature of mind that has no peer in Western religion or Western science” (Harris 2014: 29). Like Harris, Fausnight says that there is little that atheists can learn from Western religions about happiness, but Eastern religions like Buddhism are much more focused on it, and they hold that “Happiness is found within you. … From a Buddhist perspective, it is gained by letting go. It is found with inner peace. No one can get you there but yourself” (Fausnight 2010: 168). Also, Comte-Sponville sees Eastern religions as being more useful for atheists than monotheistic ones, and he does not even count them as religions, but “a mixture of spirituality, ethics and philosophy rather than a religion … They are less about God than they are about human beings and nature. They have to do less with faith than with meditation” (Comte-Sponville 2006: 2, italics original). These examples also point out their eclecticism – all three are drawing from both Western and Oriental influences and practices such as science, Buddhism, and meditation. What is noteworthy is that the main focus of all three books is not atheism, but spirituality. Harris says that it is a problem that many atheists conceive of the talk of spirituality as a kind of mental illness in a situation where people ought to find a rational approach to spirituality: “A rational approach to spirituality seems to be what is missing from secularism and from the lives of most of the people I meet” (Harris 2014: 10, 11). Fausnight (2010: 68) considers that the point of his book is spirituality “within the confines of the materialist and scientific viewpoint”. According to Comte-Sponville, spiritual life is more important than atheism or anything else, because “It is our noblest part, or rather, our highest function … Man is a … spiritual animal” (Comte-Sponville 2006: 134). One difference between these three authors is that Harris is more critical towards monotheistic religion than Comte-Sponville or Fausnight. However, Harris’s criticism has clearly softened since the early years of new atheism, and even he seems inclined towards bridge-building, stating: “For many years, I have been a vocal critic of religion, and I won’t ride the same hobbyhorse here” (Harris 2014: 7). Thus, one can find a pattern from these three books: There is no other reality than this-worldly material reality, which is perceived by the human mind in the present moment. Therefore the focus of spirituality is in the human mind and how to cultivate things/states like happiness, meaningfulness, morality, positive feelings, and transcendent experiences through, for example, practices like meditation. Religious influences are taken, but mostly from Oriental religions, especially Buddhism. This turn towards Buddhism is quite understandable since it is commonly seen as a nontheistic religion while it denies the idea of the creator-god and focuses on human happiness attained by practical methods such as ethics and meditation. So, what can be learned from the comparison between the two approaches to spirituality? Let’s start with the question of how spirituality and atheism can be understood and combined. The examples provided here highlight that the possibility of their positive mutual entanglement depends, firstly, on the position and function of atheism in a worldview, and secondly, on the understanding of spirituality as something universal. The Soviet atheists argued that by being “conscious”, Soviet atheism differs essentially from “bourgeois” atheism, which was a secondary result, a mere outcome of materialism, rationalism, and so on, while the Soviet ideologists considered atheism primary, a “conscious” starting point, which leads to a scientific worldview. The question – which is primary, which is secondary, atheism or its accompanying phenomena – inevitably resembles the famous chicken-egg controversy, but also points to how atheism and spirituality can be combined. In its minimal philosophical definition – the absence of believing in god(s) – atheism is a result of the underlying premises that depend on a particular time and place, such as the lack of the concept of God in a particular culture or the lack of religious socialization, or naturalism, or the science-religion opposition. Concurrently, atheism as a conviction can lead to further elements that define atheism in a particular cultural context, such as naturalism, science-religion opposition, rationalism or anti-religious activity. Thus, we can postulate that atheism is a “meeting point” of different ideas, practices, and attitudes that somehow revolve around the absence of belief in god(s). This position offers a possibility to associate atheism with the elements that also constitute spirituality, thus connecting atheism with its surrounding context, be it a utopian future or personal self-development. Some of these elements can be preconditions of atheism, while some of them can be results – here, atheism functions as a mediator between them. For instance, scientific knowledge can be both – a reason for atheism, or a result of atheist conviction, just as the Soviet atheists hoped. As for the understanding of spirituality, Huss (2014) has distinguished between two approaches: for some scholars it is a universal entity, common to all people regardless of their religiosity or secularity, while the others regard it as a newly constituted cultural category that challenges the modern era’s division between religious and secular. From the emic point of view, our two “spiritual atheisms” clearly support the understanding of spirituality as something universally human: in their approach, ‘“spiritual” attitudes, values and commitments are distanced from religious worldviews and the supernatural, and established in an immanentist context’ (Schnell and Keenan 2013; 2011). Blurring the lines between the secular and religious is clearly a question of power relations; thus spirituality becomes a battleground that can be ‘hijacked’ either for religious or secular purposes. Yet, the aims for doing so can be entirely different. In contemporary atheist spirituality, spirituality is understood pretty much on the lines of “alternative spirituality”, as a lived experience of existential questions, with the goal of subjective well-being and self-development, similarly to “self-spirituality” (Heelas 1996). Here, spirituality stands for finding the meaning of life, inner peace, mindfulness, morality, wonder, and awe. In the context where spirituality is strongly associated with religiosity and the majority of the population is “institutionally” religious, the connection between atheism and spirituality offers a possibility to show that atheists are “normal”, have similar feelings, morality, compassion, and so on, but it just comes from a different source. Still, they also use the concept in Huss’s (2014) other meaning to challenge the division between religious and secular. The fact that spiritual atheists are prone to borrowing from Eastern religions and openly admit it, also indicates that their goal is bridge-building. In the Soviet context, spirituality was also regarded as universal; “life’s questions” were the same for both religion and atheism, and self-development was of utmost importance. Yet, as Luehrmann (2016) has argued, the Soviet atheists tried to locate the meaning of human existence in the relationships between the individual and society. Here, personal spiritual development – a growing awareness of the relationship between individual and society – is only a stepping stone towards the ultimate goal of building the Communist society. Spirituality in this setting does not only imply an interest in existential questions, but is also a process of conscious realization of these interests through living “the Soviet way of life”, that is, primarily through the means of “culture”, which is by definition secular: like studying the piano, reading books to be smarter and acquiring a better understanding of existential questions and meaning of life, or attending concerts in order to feel solemnity, and practicing sports in order to be healthy and develop one’s willpower. Therefore, in the Soviet context the main question was about the purpose of spirituality. One can have tremendous willpower because of religious convictions, or work well in the factory because of the fear of God, but as Soviet ideologists claimed, believers’ inner reasoning is just plain wrong – projecting their ideals into the imaginary world does not help to develop “real life”. Thus, despite the similarities, our two “spiritual cultures” (Smolkin 2018: 226) have entirely different tactics. Both regard spirituality as something universally human, but while the conclusion of contemporary Western atheist spirituality is “therefore we are like you, believers”, which can be seen as “bridge-building”, their Soviet counterparts concluded “therefore you don’t have a monopoly here –given the circumstances of the advancements of science and Soviet reality, we do”, which rather leaves an impression of “bridge-breaking” (see Table 1). A comparison of two combinations of atheism and spirituality. But what can be said about the sudden emergence of such “chimeras” like spiritual atheism, and what does it tell us about the development of atheist traditions? Finding deeper meaning is a psychological core character of human beings (Paloutzian & Park 2013), and atheists are no exceptions. Therefore, the combination of ‘spirituality’ and non-theism/naturalism is not anything new. For instance, in ancient Greece, Epicureanism was a fully naturalistic and hedonistic spiritual school (Stróżyński 2003); in the 19th century, French positivist Auguste Comte founded the naturalistic Religion of Humanity (Spencer 2014). Yet there seem to be a number of factors that precede the sudden desire to crossbreed these species publicly. In addition to the two theoretical factors discussed above, the understanding of spirituality as a “contested space” and atheism as an outcome or foundation, there is a third major aspect that is connected with the social sphere – that it is a reaction to something. Seen from that angle, despite the huge differences in socio-political background, both cases arise from a fairly similar context. “Spiritual atheism” can be seen as a reaction to the decline of “traditional” ways of meaning-making, where religion had considerable authority. Whether it is due to the “forced” (Froese 2004) or “normal” secularization – or other reasons that have been constantly discussed in the sociology of religion over the past 150 years – the situation is similar: lack of existential guidance in the context where the number of unbelievers has significantly increased. Thus, spiritual atheism can be seen as one part of a larger cultural phenomenon: alternative meaning-making, which emerges when the traditionally dominant factors of the scene begin to deteriorate. In the Soviet Union the process was directed more “from above” by state ideology, while in the individualist West it is more “organic” (see Zuckerman 2007), arising from the people’s personal needs, and everyone is allowed to seek their eclectic “own way”. Perhaps it is justified to make a distinction between “atheist spirituality” and “spiritual atheism” – although these two concepts overlap to a great extent: in “atheist spirituality”, spirituality is the main subject, and this emphasis seems to describe better the combination of atheism and spirituality in the contemporary West, whereas “spiritual atheism” refers to a phenomenon where atheism is primary and spirituality is secondary, which better describes their combination in the late Soviet Union. Another similarity is that both spiritual cultures were preceded by a very aggressive strand of atheism: in the Soviet case, Khrushchev-era atheist propaganda, in the contemporary Western case, the “New Atheism”. Both aggressive versions seemed to miss something essential – not particularly in their teachings but in human psychology: that opposition to something or even factors that are often associated with atheism (such as rationality, naturalism, science, criticism of religion) do not necessarily provide a deeper meaningfulness or purpose in life. Instead, failing to produce a positive alternative for religion in combination with the aggressive rhetoric results in a bad reputation for atheism. Of course, in the US, the reputation of atheism has always been bad, but it is remarkable that the aggressiveness and intolerance of New Atheism has resulted in strong criticism even among the secular and atheist community, and they are seen as the main reasons for the loss of their support (Amarasingam & Brewster 2016).5 The pattern is similar in both instances: after an initial period of aggressiveness (that lasts less than 10 years) a new, more moderate wave emerges that tries (more or less) to distance itself from its predecessor or offer an alternative, where “scientific” and “rational” arguments are complemented with existential questions. The goal in both cases is similar: to prove that atheism is not just negative, but also offers something positive, encouraging emotions, aspirations, and other things considered part of normal life. Therefore, the turn towards spirituality can be also seen as a PR-tactic, as an attempt to improve the reputation of atheism. We know that rebranding of the existing current of atheism through the top-down method in the Soviet case was not successful and the result can be described through the expression attributed to the late Russian politician Viktor Chernomyrdin: “We wanted to do better, but it turned out as always.” As for the success of the grassroots-method of the contemporary atheist spirituality that presents itself as a different current, it is hard to say anything concrete since it is still a work in progress. Yet it is quite evident that the patterns described here reveal more about human psychology rather than inherent developments of atheist traditions. In conclusion, our comparison highlights the variety of configurations of atheism(s), and their accompanying phenomena, functions, and goals, which always depend on social situations and the individuals affecting it. It brings forth the need to emphasize that atheism and criticism of religion are two different things: not all atheists are critical towards religions, and also that atheists can view religion as having positive and useful aspects. Moreover, there has been a growing criticism among scholars of religion towards the unhelpful dichotomy between the ‘secular’ and the ‘religious’ and it is surprising to find that even some strands of atheism are interested in a blurring of these boundaries – although their final goals can be exactly opposite. The “rise of the nones” demonstrates that a growing population of people is willing to fulfill their spiritual abilities and needs without traditional monotheistic religions (Taylor 2007) and there are multitudes of possibilities how that can be done. Here, the Soviet experience of “forced” atheism provides an interesting case study. For some reason (a language barrier? ), comparative studies of Soviet atheism with contemporary Western atheism have been neglected, yet they can offer interesting insights and have “comparative and theoretical importance for studies of religion and modernity” (Luehrmann 2015: 12). 1Originally in French L’Esprit de l’athéisme: Introduction à une spiritualité sans Dieu (2006). Translated by Nancy Huston. 2For an overview of the discussions among Soviet academics and party officials that led to the emergence of “life’s questions” within the Soviet atheism, see Smolkin (2014, 2018) and Luehrmann (2015, 2016). 3Although Russian and Estonian languages are entirely different, the meaning of “spirituality” (dukhovnost’ or vaimsus, respectively) largely overlaps, especially in the meaning discussed here. The connotations of spirituality and its place in Soviet ideology are discussed, for instance, in Luehrmann (2011: 165–192), Smolkin (2018) and Halstead (1994). Still, for some reason, in Estonian language atheist literature, “spiritual development” as a technical term was almost absent and the expression “life’s questions” was used instead. 4For the development of communist morality see Field (2007). 5It is interesting to note that despite Estonia having a reputation of being “the most atheistic country in the world”, the reviews in response to the translations of the new atheists’ books have been rather critical on the grounds of their resemblance to the Soviet Era atheism. This article is written with a support from the Baltic Sea Foundation grant “The Relocation of Transcendence: The Sacred of the Seculars around the Baltic Sea“, base funding of national sciences of the University of Tartu, grant no. PHVUS17929 and Templeton Foundation grant “Understanding Unbelief in Estonia”. The authors are indebted to Patrick Corbeil, Elliot Hanowski, and anonymous reviewers for their critical insights and constructive suggestions. Armstrong, K. 2009. The Case for God. New York: Alfred A. Knopf. Bullock, J. 2017. The Sociology of the Sunday Assembly: ‘Belonging Without Believing’ in a Post-Christian Context. PhD Thesis. Kingston University, London. http://eprints.kingston.ac.uk/41775/, looked 23.8.2018. Casanova, J. 2011. The Secular, Secularizations, Secularisms. In: Calhoun, C, Juergensmeyer, M and VanAntwerpen, J (eds. ), Rethinking Secularism, 54–74. Oxford, N.Y: Oxford University Press. Cherry, M. 2013. Freedom of Thought 2013: A Global Report on the Rights, Legal Status, and Discrimination Against Humanists, Atheists, and the Non-religious. International Humanist and Ethical Union (IHEU). freethoughtreport.com/wp-content/uploads/2013/07/FOTReport2013.pdf, looked 7.2.2014. Comte-Sponville, A. 2006. The Book of Atheist Spirituality: An Elegant Argument for Spirituality Without God. London: Bantam Books. De Botton, A. 2012. Religion for Atheists: A Non-Believers Guide to the Uses of Religion. London: Penguin. Discover Magazine. 2010. Richard Dawkins, the Spiritual Atheist. http://blogs.discovermagazine.com/intersection/2010/09/20/richard-dawkins-the-spiritual-atheist/, looked 3.7.2012. Dontsov, I. 1976. Inimliku enesetäiustamise probleem marksistlikus ja kristlikus eetikas. In: N.A. (ed. ), Ateism, religioon, kõlblus, 99–113. Tallinn: Eesti Raamat. Duluman, J and Romenets, V. 1976. Usklikkuse motiivid ja ateismipropaganda. In: N.A. (ed. ), Individuaalne lähenemine ateistlikus selgitustöös, 21–27. Tallinn: Eesti Raamat. EFA 1: Eesti Filmiarhiiv [Estonian Film Archive]. 1976. 10 minutit võitleva ateistiga. 717.5068. Eller, JD. 2010. What Is Atheism? In: Zuckerman, P (ed. ), Atheism and Secularity, I: 1–18. Santa Barbara: Praeger. Epstein, GM. 2009. Good Without God: What a Billion Nonreligious People Do Believe. New York: Harper. ERA 1: Eesti Rahvusarhiiv [Estonian National Archives]. 1968. Documents of Scientific-Methodological Board of Scientific Atheism of the Znanie Society. R-2048.1.816, 99. ERA 2: Eesti Rahvusarhiiv. 1974. Documents of Scientific-Methodological Board of Scientific Atheism of the Znanie Society. R-2048.1.1181, 11. ERA 3: Eesti Rahvusarhiiv. 1982. Documents of Scientific-Methodological Board of Scientific Atheism of the Znanie Society. R-2048.1.1772, 33. ERA 4: Eesti Rahvusarhiiv. 1976. Documents of Scientific-Methodological Board of Scientific Atheism of the Znanie Society. R-2048.1.1315, 20. Fausnight, JK. 2010. Going Godless: Rediscovering Spirituality in a Material World. New York: iUniverse. Field, DA. 2007. Private life and communist morality in Khrushchev’s Russia. Peter Lang. Frisk, L. 2010. Globalization: A Key Factor in Contemporary Religious Change. Journal of Alternative Spiritualities and New Age Studies, 5: 1–14. http://www.open.ac.uk/Arts/jasanas/, looked 11.8.2016. Gubakov, N. 1976. Mõiste ”religioosne moraal” analüüsist. In: N.A. (ed. ), Ateism, religioon, kõlblus, 69–82. Tallinn: Eesti Raamat. Harris, S. 2004. The End of Faith. Religion, Terror and the Future of Reason. London: The Free Press. Harris, S. 2014. Waking Up: A Guide to Spirituality Without Religion. New York: Simon & Schuster. Heelas, P. 1996. The New Age Movement: The Celebration of the Self and the Sacralization of Modernity, 1 edition. Blackwell Publishers, Oxford; Cambridge, Mass., USA. Helkama, K. 2009. Moraalipsykologia. Hyvän ja pahan tällä puolen. Helsinki: Edita. Kääriäinen, K. 1989. Discussion on Scientific Atheism as a Soviet Science, 1960–1985. Suomalaisen Tiedeakatemian toimituksia. Akateeminen Kirjakauppa. Kitchanova, I. 1976. Marksistlik humanism ja selle kristlikud kriitikud. In: N.A. (ed. ), Ateism, religioon, kõlblus, 53–68. Tallinn: Eesti Raamat. Kononenko, V. 1976. Marksistliku ateismi kõlbeline väärtus. In: N.A. (ed. ), Ateism, religioon, kõlblus, 38–52. Tallinn: Eesti Raamat. Luehrmann, S. 2015. “Was Soviet Society Secular? Undoing Equations between Communism and Religion.” In: Atheist Secularism and Its Discontents. A Comparative Study of Religion and Communism in Eurasia, Ngo, TTT and Quijada, JB (eds. ), 134–151. Springer. Maisel, E. 2009. The Atheist’s Way: Living Well Without Gods. Novato: New World Library. Marx, K and Engels, F. 1974. Sochineniia, 42. Moskva: Izdatel’stvo Politicheskoi Literatury. Mets, E. 1956. Siduda loenguline propaganda kommunistliku ülesehitustöö praktikaga. Rahva Hääl, 20 March. Molchanova, V. 1976. Usklike kaasahaaramine töösse ja ühiskondlikku ellu. In: N.A. (ed. ), Individuaalne lähenemine ateistlikus selgitustöös, 15–20. Tallinn: Eesti Raamat. Oja, K. 1971. Sektantliku moraaliõpetuse põhimõtetest. In: Religiooni ja ateismi küsimusi minevikus ja tänapäeval. Tartu Riiklik Ülikool, Tartu. Paloutzian, RF and Park, CL. 2013. Recent Progress and Core Issues in Science of Psychology of Religion and Spirituality. In: Paloutzian, RF and Park, CL (eds. ), Handbook of the Psychology of Religion and Spirituality. Second Edition, 3–22. New York: The Guilford Press. Peris, D. 1998. Storming the Heavens: The Soviet League of the Militant Godless. Cornell University Press. Raid, L. 1972. Usklikud ja kommunistid. Tallinn: Eesti Raamat. Remmel, A. 2011. Religioonivastane võitlus Eesti NSV-s aastail 1957–1990: tähtsamad institutsioonid ja nende tegevus. Tartu: Tartu Ülikooli Kirjastus. PhD thesis. Remmel, A. 2015. (Anti)religious Aspects of the Cold War: Soviet Religious Policy According to the Example of the Estonian SSR. In: Tannberg, T (ed. ), Behind the Iron Curtain. Estonia in the Era of the Cold War, 359–392. Frankfurt am Main: Peter Lang. Salo, V. 2000. Riik ja kirikud 1940–1991, Maarjamaa taskuraamat. Maarjamaa, Tartu. Sheinin, L. 1964. Surnute mälestamise raamat. Edasi, 28 July. Sillfors, M. 2017. Jumalattomuus ja hyvä elämä: ateistinen henkisyys vaihtoehtona monoteistiselle uskonnolle 2000-luvun länsimaissa. PhD thesis. Helsinki: University of Helsinki. Smolkin, V. 2018. A Sacred Space Is Never Empty: A History of Soviet Atheism. Princeton University Press. Spencer, N. 2014. Atheists: The Origin of the Species. London: Bloomsbury. Stróżyński, M. 2003. Mystical Aspects of Epicureanism. Organon, 32(2003): 45–63. Taira, T. 2012. Atheist Spirituality: A Follow-on from New Atheism? In: Ahlbäck, T (ed. ), Post-Secular Religious Practices, 388–404. Turku: Donner Institute for Religious and Cultural History. Taylor, C. 2007. A Secular Age. Cambridge, Mass: Harvard University Press. Valton, A. 1968. Üks tund võitleva ateistiga. Kaheksa jaapanlannat. Tallinn: Perioodika. Vimmsaare, K. 1969. Luterlus enne ja nüüd. Tallinn: Eesti Raamat. Vimmsaare, K. 1981. Ükskõiksus – on see hea või halb? Tallinn: Eesti Raamat. Woodhead, L. 2016. The rise of ‘no religion’in Britain: The emergence of a new cultural majority. Journal of the British Academy, 4: 245–261. Zuckerman, P. 2007. Atheism. Contemporery Numbers and Patterns. In: Martin, M (ed. ), The Cambridge Companion to Atheism, 47–65. Cambridge: Cambridge University Press. Zuckerman, P. 2012. Faith No More: Why People Reject Religion. Oxford: University Press.